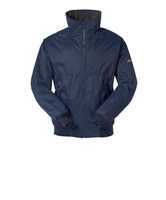 Launched in 1988, the Snug Blouson has become a MUSTO classic. With showerproof protection and a warm fleece liner, this jacket has kept generations of people warm and dry in the marina and in the field. The sailing inspired high collar blocks the wind for added weather protection and the ribbed hem and cuffs create the timeless snug fit and silhouette. Welted, zipped side pockets and an internal security pocket mean you can keep your possessions safe. This is timeless style for everywhere.